Isuzu Commercial Truck of America, a distributor of low-cab forward trucks introduced its newest model, the 2016 NPR Diesel. The truck features a 13,000-lb. 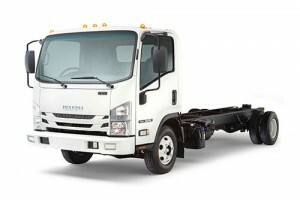 gross vehicle weight rating (GVWR) and a 33.5-inch frame to offer more capability than previously available in an entry-level Isuzu diesel truck, the company said. The 2016 NPR Diesel features a standard 50-gallon, rear-mounted, in-rail fuel tank and four wheelbases—109, 132.5, 150 and 176 inches—that will accept body lengths up to 20 feet. Its frame width of 33.5 inches will accept bodies up to 102 inches wide and 91 inches high. The new NPR Diesel is powered by the three-liter 4JJ1-TC turbocharged and intercooled diesel engine. The powerplant produces 150 horsepower and 282 lb.-ft. of torque at 1,600 to 2,800 rpm. The engine has a B-10 diesel engine life rating of 310,000 miles, and it can run on B20 biodiesel fuel. The 2016 NPR Diesel comes with a standard powertrain limited warranty that covers engine and drivetrain against defects in material and workmanship for three years, unlimited mileage. The truck is also under warranty against perforation from corrosion for four years regardless of mileage. The 2016 NPR Diesel will be available at Isuzu’s network of nearly 300 dealers in North America soon after production starts in Japan in November.